Beautifully engraved Certificate from the The California Mexico Land Company issued in 1888. This historic document has an ornate border around it with the company's name in bold fancy print on top. 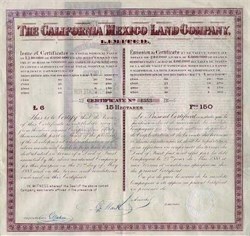 This certificate represents shares in a company purchasing land at a cost of 6 Pounds or 150 Francs for 15 Hectares (1 hectare = 2.4710 acres)in Lower California. This item is hand signed and is over 115 years old.